Home improvement and DIY experts tend to agree that mobile home kitchen makeovers should be a top remodeling priority. They have great return-on-investment rates and can make an entire home appear more modern. Regardless of budget, you can create a beautiful, high-functioning space that would make any homeowner proud. Here are 6 great kitchen makeovers that are sure to inspire! We featured this home makeover a few months ago. Chantal lives in upstate NY in this 2000 model double wide. This kitchen makeover is a great mix of rustic, natural tones and rich, warm textures. One of the biggest changes made was the cabinet replacement. 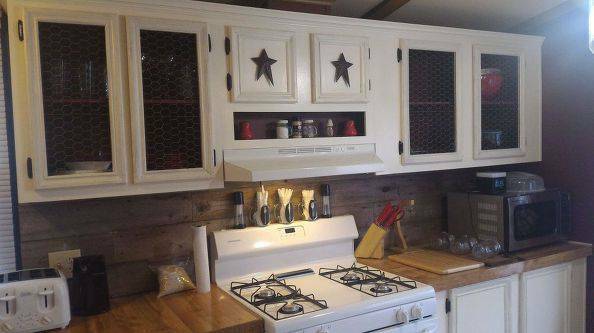 Chantal replaced the manufactured home cabinetry with custom built pieces. It’s a bit expensive but you can’t beat the upscale look it provides. Oh, and the backsplash is pretty darn awesome, too! You can see more of this beautiful home here! This next kitchen makeover is great because it proves you don’t need to change everything to get a beautiful kitchen. 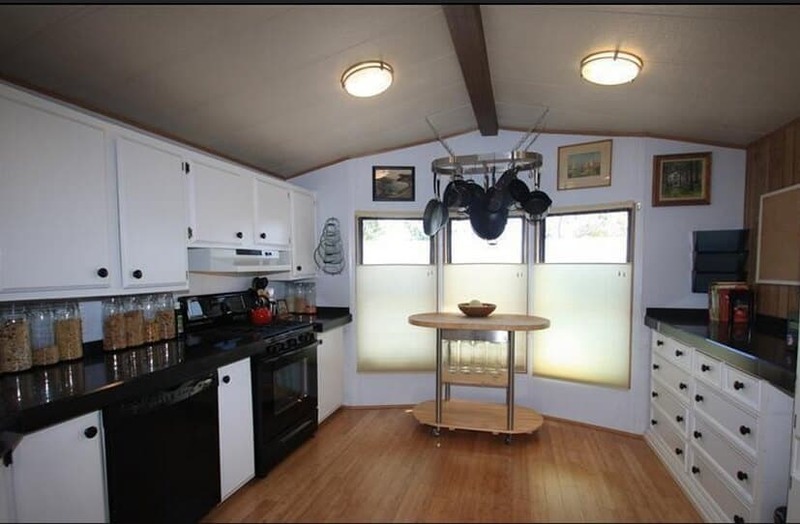 Unfortunately, I couldn’t find any additional information on this mobile home kitchen makeover, other than this photo, but the photo speaks volumes. Obvious changes include: walls were painted, new laminate flooring was laid in the kitchen and carpet in the living room, and new laminate on the counters. 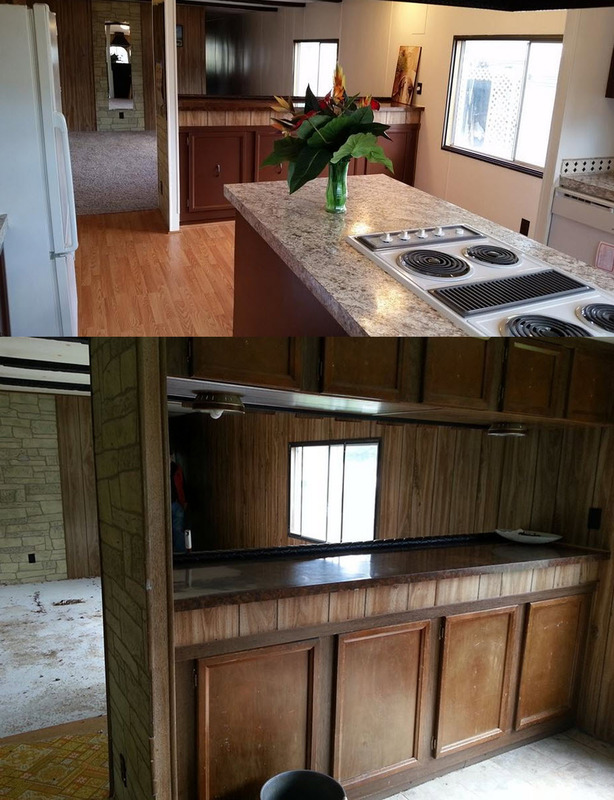 This remodel proves that you can change only the major surfaces of a kitchen and still create a remarkable room. This bachelor pad kitchen is a beautiful example of modern simplicity in a mobile home kitchen makeover. This kitchen makeover focuses on simplicity and modern materials. Stark black counters paired with white cabinetry create a modern space. The window screens are an unique feature. Plexiglas has so many great uses, using them as a privacy screens on windows allow plenty of light and ample privacy to the home. You can see more of this great kitchen and the rest of the home here! 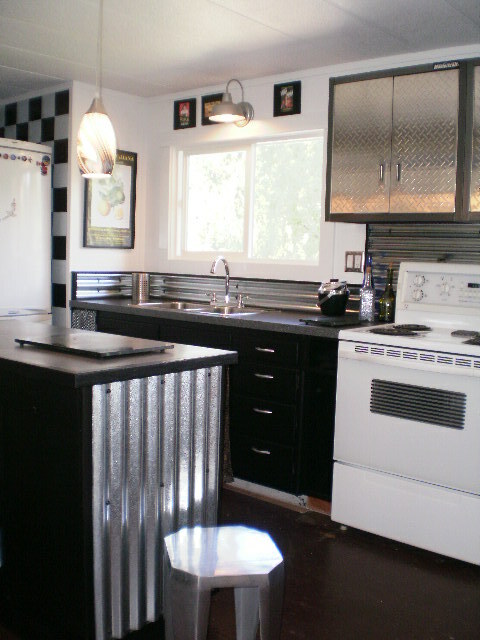 This Canadian single wide remodel uses sheet metal throughout the home. Sheet metal is an affordable, waterproof, rustproof, and long-lasting material that can be a perfect addition to home both inside and out. Black and white are popular colors for kitchens. 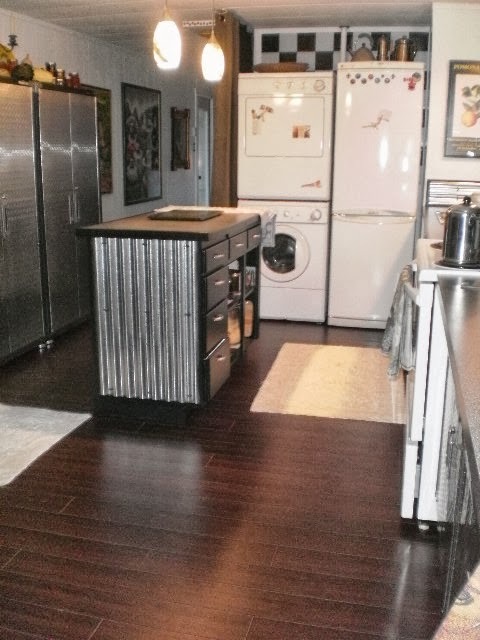 Gina, the owner, used metallic accents sparingly in the kitchen. She even uses garage cabinets as a storage solution! See the rest of this awesome sheet metal mobile home here! 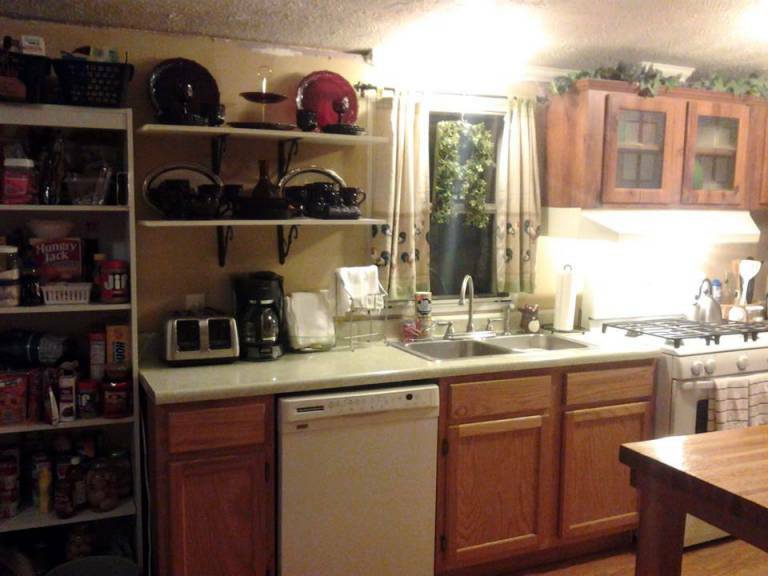 This next mobile home kitchen makeover is creative. The owner did a great job of using easy-to-find (and afford) materials to reface the upper cabinets. The back splash is recycled wood that gives the space a great warmth. The ivory chicken wire cabinets paired with beautiful wood counter tops really pull the space together and provokes a timeless farmhouse/country style. You can see more of this great kitchen makeover on Home Talk (along with the instructions). Justin and Stephanie Richards purchased their 2003 single wide manufactured home in 2013. The home sits on 11 acres in Sistersville, WV (YAY WV!). The home has two additions built onto the front of the home which is used as a living room and guest bedroom. As with most used home purchases, the Richards’ knew the structure needed work when they bought it. It was only after they moved in that they realized just how much remodeling it was going to need. I think that happens to all of us that buy a used mobile home, regardless of age. Small details are easily missed when viewing a home and it takes a couple of weeks to start noticing the little issues. Nevertheless, the couple repaired and replaced their way to a great home! New sub-flooring and laminate installed throughout the home. There was a leak left unattended that damaged the sub-flooring so badly that it waterlogged and bubbled. New lower cabinets installed. The leak was so severe the bottom kitchen cabinets became waterlogged as well. Water will always be the biggest threat to manufactured homes. Upper cabinets removed. Shelving installed above counter space is a popular trend for smaller kitchens. It opens up the space and provides convenient storage solution. Living room space turned into a dining room. 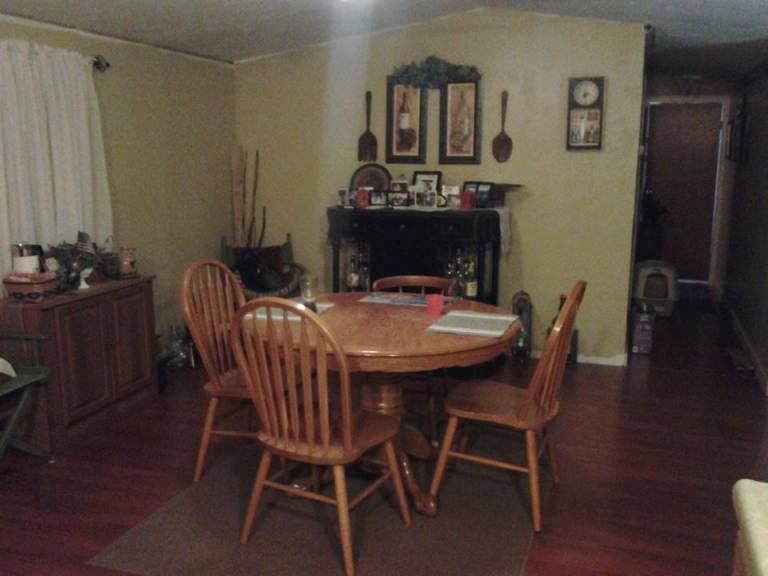 Since the home has an addition used as a living room they were able to create a dining space in the old living room. Removed the bar area. 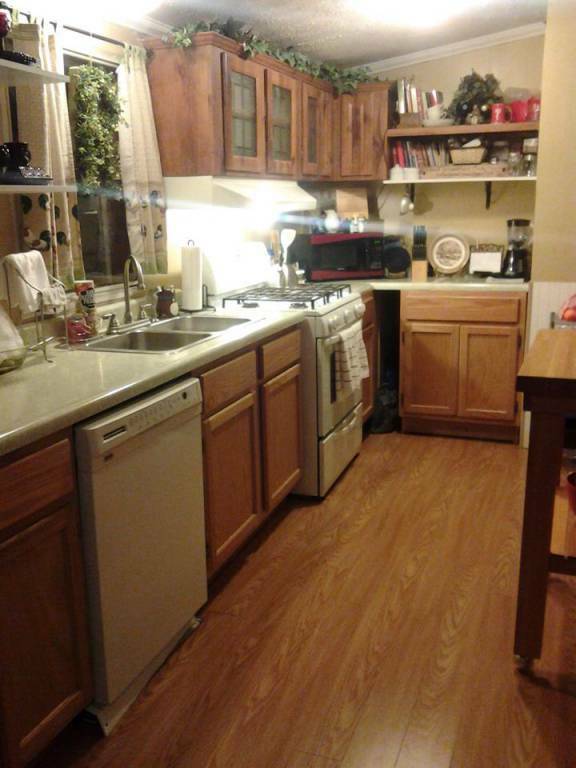 The cabinets originally created an L-shaped counter space but it wasn’t very convenient. The Richards’ removed the bar area and added a small island. Painted the kitchen and dining area in Rafia Ribbon by Behr. 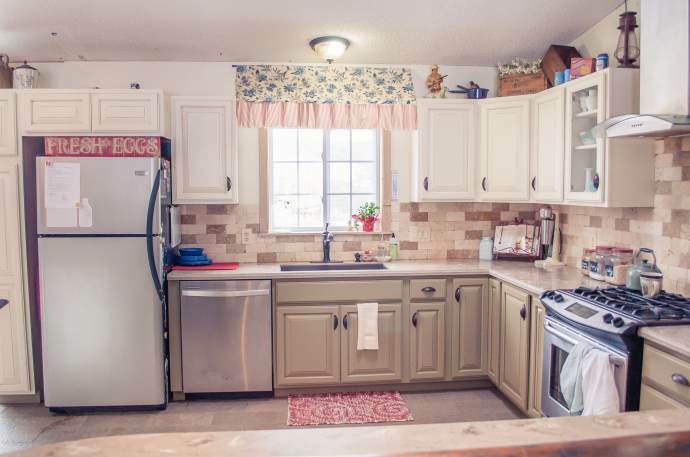 These are great mobile home kitchen makeovers that are sure to inspire you! Regardless of what style you like or what your budget is, you CAN have the kitchen you want. All you need is a little creativity and inspiration – and you’re at the right place for inspiration! Thank you so much for reading Mobile and Manufactured Home Living. 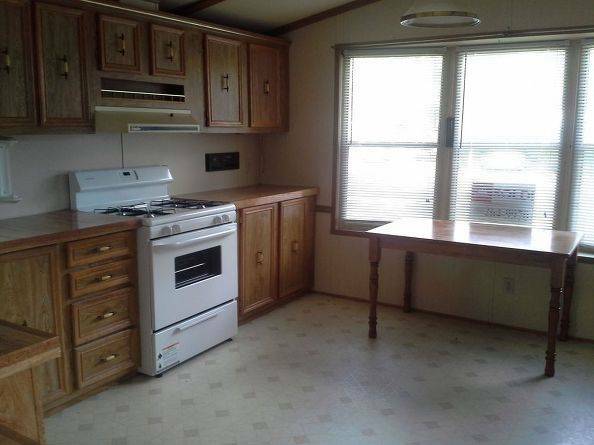 See more great mobile home kitchens here. 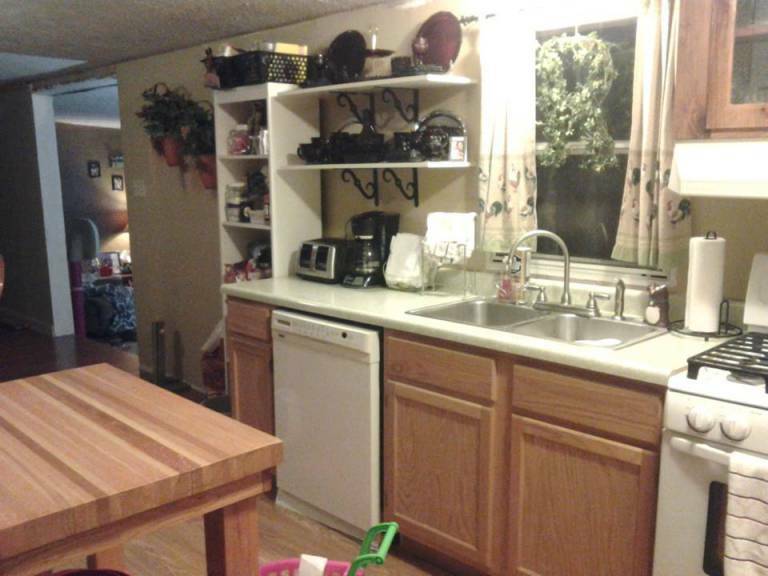 Have a 2005 Solitaire Manufactured home…My problem area is the wasted space in kitchen cupboards/cabinets..those “you can never reach them” areas. Lower cabinet door openings are about 11″wide x 22″ high. with top and bottom shelf which is about 3/4″ thick. I’m guessing I’m losing about 22″ x 22″ of space x the two shelves… I thought about a corner turn table unit but with the shelves I can’t seem to find any that would fit. At age 81, there is no way I’m able to utilize the wasted space in the corners (upper and lower u nits). Do you know of any sources that might carry a solution for me? 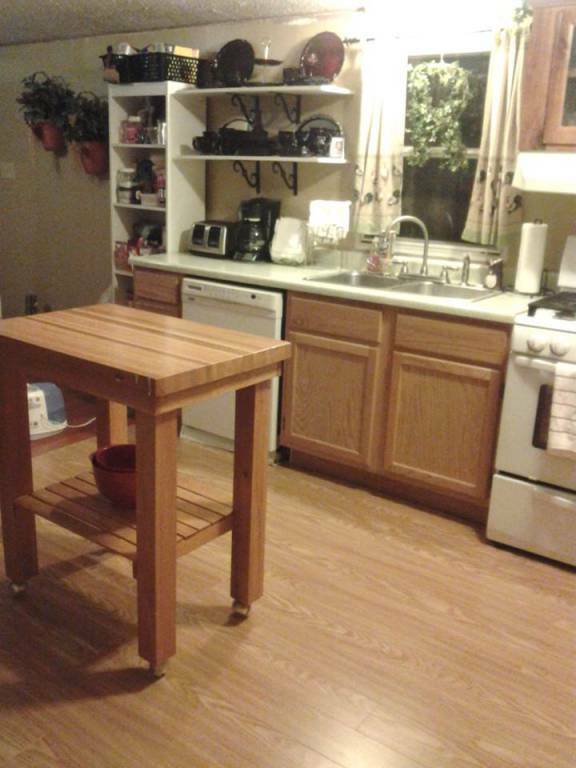 I think a lazy Susan would be perfect for that space. You can buy the lazy susan separately from the cabinet, too. That would allow you to be able to create the cabinet or surround yourself and to your needs. 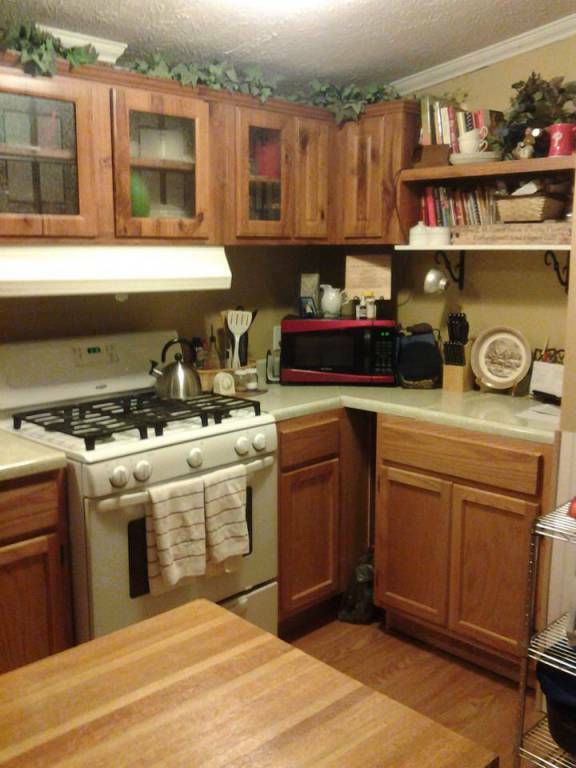 Or, you could just leave it without a cabinet. The full circle ones are nice looking. Click this link to see the lazy susans I found at Lowe’s. Just wanted to say that I’m in love with your newsletters I receive and your site. It makes me want to buy an older trailer and fix it up as my home. You gave me inspiration when it came to remodeling my ’70 Airstream also. Take lots of photos – I love to share great Airstream stories! (Disclosure: I am an affiliate for them but I don’t know how to create a link so this is not an affiliate link). They have a lot of good information on skirting but I haven’t had a chance to compare prices recently. They usually have the best prices but the shipping can get expensive on some items. I have a question, and you may or may not have the answer. ???? We have a 1988 Crimson double wide. Many of our ceilings are vaulted, but the bedrooms, kitchen baths and laundry have flat ceilings. Our issue is we definitely need to increase our R-value. We’ve seen it done on you tube, blowing in the insulation. But is going in through the roof the best option? We have Sheetrock ceilings. Also would you or your network have an idea of an actual cost to add insulation? I love your site and am an avid reader. Also, I think you should do a site “better mobile homes and gardens”. There are so many options and improvements that we do to our homes. ???? Just a thought. To be honest, I’m not real knowledgeable about insulation installation. I only know what I’ve read. I’ve seen it used in older mobile home ceilings so I imagine it would be a perfect solution for newer ones as well. Sorry I couldn’t help much! Perhaps you could call a roofing specialist in your area and see what they recommend.